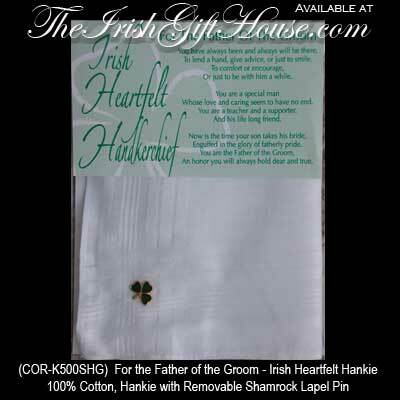 This Irish wedding hankie is for the father of the groom and it is enhanced with a removable shamrock lapel pin. To lend a hand, give advice, or just to smile. Or just to be with him a while. Whose love and caring seem to have no end. You are a teacher and a supporter. And her life long friend. Engulfed in the glory of Fatherly pride. An honor you will always hold dear and true. The father of the groom Irish wedding hankie features 100% cotton material along with a removable shamrock lapel or tie pin.